These 100% Plastic Magnum Index Copag Playing Cards feature extra large numbers and pips for easy reading. 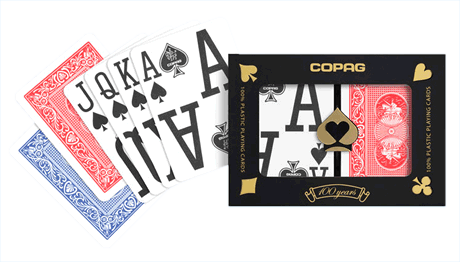 Copag Magnum Playing Card Sets feature one blue and one red deck. The decks have a mirror image of the circular Copag logo on each side. Each two-deck Magnum Playing Card Set comes in a sturdy black plastic storage box. For additional information or wholesale pricing on Plastic Copag Magnum Playing Cards, please call 1-800-233-0828.